Sovereign Hill is Australia’s leading outdoor museum showcasing Australia’s marvellous gold rush history, since its opening in November 1970 it has become an Australian tourism icon and has won numerous tourism awards. Known as a living museum emphasising working machinery and displays, costumed interpreters and visitor involvement, it’s no wonder Sovereign Hill attracts 450,000 people each year from around the world. In July Sovereign Hill hosts a special Christmas In July event, during Winter Wonderlights the whole site is adorned with Christmas decorations, with wreaths at every shop front and lots of Christmas trees and stays open later than usual and this is for a special reason. At 5.30pm each night make sure you standing mid street and watch the buildings of Sovereign Hill light up – add to that the snow (the fake bubble kind) and music and it’s a magical street party you’ll be glad you stayed for. During the day its business as usual at Sovereign Hill township, visitors can stroll down Main Street as snow-flakes fall at regular intervals over the Victorian-style buildings, decorations fill the window displays, the smell of Christmas treats and spices fill the air, and traditional Christmas-themed pantomimes are performed in addition to regular attractions and performances there are regular snow falls, Christmas goodies to buy, Christmas carolling and a Christmas-themed theatrical program. Then at night, Main Street will sparkle with an amazing light projection show with over 20 of Sovereign Hill’s buildings lit up with large-scale image projections and Christmas animations. Children can also catch the Gingerbread Man as he dashes from building to building, peeking out from the Christmas themed lights and animation. But do note that it’s cold in Ballarat (really cold) so dress warm (think hats, scarves, gloves, layers, two pairs of socks and a winter coat) and you will be fine but with so much to do and see we certainly didn’t have time to stand about feeling the cold. And here’s a handy tip: you can get your entry ticket stamped at the Main Street Post Office (or the desk near the exit) and this will allow you entry again the following day, for FREE! two days for the price of one so stay and see a little more. Book a sit-down Christmas dinner in advance this is an experience that’s now to be missed..
Make sure you visit the Confectionary Shop as it’s just not possible to visit to Sovereign Hill without stocking up on boiled lollies. Recently we spent 5 fun filled days in beautiful Auckland. As part of our trip we spent a few nights staying in Rotorua, a place known for bubbling mud pools, shooting geysers and natural hot springs, as well as showcasing the fascinating Maori culture. We stayed with Holiday Inn, as they never disappoint me, I can always relax and let them take care of everything plus with Kids Stay & Eat Free* and the VIK (Very Important Kids) program, the hotel is a great base for both families and adventurers to explore. Holiday Inn Rotorua is the perfect destination to warm up this winter. Location Location Location…. Relax in geothermal hot springs or explore the Redwoods forest mountain bike trails. The mild weather in New Zealand means that you can stay active all year round with plenty of activities to entertain everyone. Holiday Inn Rotorua is situated on the edge of the beautiful Whakarewarewa Forest. It’s the closest hotel to the famous Rotorua mountain bike trails and after a day exploring, reward your body with a swim in the geothermally heated pool or enjoy the garden spa, it was such good fun for all of us, the excitement of swimming outdoors in the middle of winter was a major highlight for the kids. If your heading into town for the afternoon or a thrill-seeking day out, jump on the complimentary shuttle service for guests to and from the Rotorua Tourism Centre on Fenton Street and you will be in the middle of everything you need. During your stay at the hotel, you can explore Rotorua’s wide range of experiences and attractions. With its well-known Maori cultural shows, geothermal activity and adrenalin pumping activities there is something for everyone. There are three different room types; Standard, Superior and Deluxe. So you’ve got a few options to choose from depending on what you need size-wise, comfort-wise and in keeping with budget. The rooms have a modern but classic, comfortable feel to them, with everything feeling new and fresh. It’s expansive grounds made a welcome change to other airport hotels we have stayed in, perfect for the kids to get outdoors and enjoy some sunshine and have a run around if you have been cooped up on a flight for a while. Our whole trip to New Zealand was made so much more enjoyable by staying in comfortable and family friendly Holiday Inn hotels, the wonderful staff who work here, they’re attentive and kind and make you feel really welcome. They’re able to help you out with ideas for places to eat, things to do, how to get around and where to go. You can Check out the current Packages and Special Deals by clicking here. – Book before June 21, 2017, for dates until January 31, 2018. We just loved New Zealand, so if you have any questions? Just let us know and we will be happy to chat. * Kids Stay Free – Up to two (2) children under 12 years of age, stay free when sharing a room with up to two (2) adults at any of the Participating Hotels, subject to maximum room occupancy restrictions and subject to availability. Baby crib/cot is complimentary while rollaway beds may be chargeable. Rules for maximum room occupancy will supersede this offer. **This post was written in collaboration with Holiday Inn (IHG Group) but, as always, opinions are honest and my own. We recently had the opportunity to attend the Legoland Discovery Centre Melbourne we are BIG Lego fans having just been to Legoland in Malaysia so we were keen to test it out. The Legoland Discovery Centre is the ultimate indoor Lego playground located in Chadstone Shopping centre which was a huge plus for me as I figured if I tired out the kids with lego, mumma would have a couple of hours to get her shop on in peace. If you’re planning a trip to the Legoland Discovery Centre or even the shop, you will notice that a lot of the workers there have nametags with minifigures attached to them. Just like Legoland Theme Parks, you’re allowed to initiate a minifigure trade with them! If you see a minifigure that you’d like, all you have to do is ask them to trade it with your own minifigure! This is a great fun activity that kids can do, especially if you have a lot of surplus or loose minifigures lying about at home, so be sure to bring a small bag of minifigures with you when you visit! The opening hours are the same as the shopping centre, and you’ll need a ticket or an annual pass to enter the Discovery Centre. Single tickets are $37.50 for adults and kids, although there are Concession Tickets priced at $27.50. If you live in Melbourne and plan on visiting the Discovery Centre regularly, it might be more economical to buy an annual pass ($81 for individuals & $77 each for families which have a maximum cap of 2 adults) which grants you unlimited access to the centre all-year round. Legoland Discovery Centre features two Lego rides, five themed Lego build and play zones, build classes from the Centre’s Master Model Builder, a 4D cinema, special party rooms for birthdays and other celebrations, Melbourne’s top landmarks recreated in LEGO® bricks in MINILAND, plus more. It’s ideal for families with children aged 3-10 and took us about 3 hours to really see everything, this is the perfect place for the kids to let there imaginations run wild in a world of colour and creativity! The centre is first discovery centre in southern hemisphere for Lego, joining a global network of Lego Discovery Centres, including nine in North America, four in Europe and two in Japan. Not to be confused with traditional Legoland Theme Parks, Leogland Discovery Centres are essentially mini versions of LEGOLAND, usually containing a mix of indoor, outdoor and interactive attractions. The multi-million dollar attraction is filled with more than 2 million Lego bricks and 13 family friendly attractions, making it the ultimate indoor LEGO playground. Adults MUST be accompanied by a child (up to 17 years old) to visit the LEGOLAND Discovery Centre. *This post was written in collaboration with above mentioned attractions but, as always, opinions are honest and my own. Auckland has a fantastic history and a world of exciting experiences waiting to be discovered. So, if the kids are up for discovering the Maori culture and heritage and uncovering a city bursting with fresh and quirky experiences, Auckland is just the spot for you. Here are our top FIVE favourites, just to get you started…. Agrodome is a fun event for the whole family, informative & very entertaining, cos lets be honest who doesn’t like farm animals. Spend the day and make sure you catch all the demonstrations with sheep, dogs and other animals, including audience participation. Make sure you do the farm and sheep shearing tours, The kids will love it! Heaps of animals are on display and the open areas for kids to explore are a good place to take the whole family. Set in the heart of 350-acres of lush farmland, yet only 10 minutes from Rotorua city centre, you’ll find this little gem. For over 40 years, visitors from all over the globe have come to the Agrodome to see the world-famous Farm Show starring a cast of talented animals. After the show you can visit the Farmyard Nursery, which is home to the cutest baby animals who are available for cuddles and photos all year round! Plus, if you really want to explore the Agrodome 350-acre working farm then join our Farm Tour. During this guided tour, you’ll get to hand-feed loads of friendly animals and sample delicious kiwifruit juice and honey from the land. Before you leave, don’t forget to pop into the Woollen Mill and Shearing Museum. Here you’ll learn the remarkable story of NZ pioneers the Bowen brothers and discover the full process of wool from the Sheep’s back to yours. Such a great experience for the kids, its easy to see why it’s one of New Zealand’s must-see attractions, open in any weather, 365 days a year! This is a uniquely down home New Zealand experience that you wont want to miss, steeped in a rich history and filled with unique Māori culture and heritage. Whether you want to be mesmerised by the boiling mud or learn more about the geological forces created in the area that lies within Rotorua, The Māori people have lived here for centuries, co-existing in harmony with the geothermal forces that lay beneath their feet. Join an hourly guided tour through the Whakarewarewa Village and experience a living Māori village. See how they use the geothermal energy for everyday use and experience traditional dances and songs (including the legendary “Haka”) from the resident kapa haka group – Te Pakira. Village entry includes entry to the Cultural Performances (11:15 and 2:00 PM daily) and access to explore the Geothermal Features and Self-Guided Nature Trails over steaming lakes and past bubbling mud. Watch the talented Kapa Haka group perform traditional Māori song and dance – there is so much to explore you will need at least half a day. The Māori Village is owned and operated by the local residents, providing an intimate look into day-to-day life in a Living Māori Village. Visit and hear stories from the tour guides who have lived here for more than five generations. Stay for lunch and enjoy a traditional geothermal hangi meal, cooked in the bubbling geothermal waters and steam of Whakarewarewa valley which produces a unique flavour which is simply delicious. Hangi experiences can be booked alongside the Whakarewarewa Village Tours, where you can choose from a full Hang meal, or be tempted by the sweet corn on the cob as a taster. Set amongst the native trees and beautiful forests of Rotorua, Rainbow Springs Nature Park offers a fun-packed and educational experience for the whole family. Learn about New Zealand’s fascinating natural history and meet the creatures who call this great land home. Animal and bird lovers flock to Rainbow Springs Nature Park, a 9 hectare (22 acre) nature park and wildlife conservation center featuring many rare endemic species, a water ride, and a beautiful natural setting of native plants and streams. Top of our list was to see the Kiwi encounter, Kiwi are shy fuzzy little flightless birds and are the park’s most famous inhabitants but as the ground dwelling creatures they only come out under the cover of darkness, but don’t worry about missing them during your daytime visit as they keep the kiwi in a nocturnal kiwi enclosure and your day pass includes repeat entry for the day of purchase until closing at 10pm, this means you can come back to the park once it’s dark to meet the kiwi in an outdoor, no glass enclosure. They often come out to play under the stars between 7pm-9pm – it’s a magical experience not to be missed! We found heaps to do including a ride on the big splash, then spent some time with birds in one of the park’s free flight aviaries plus loved the exciting bird show. Your ticket allows you unlimited admission for the day, so if you’re close by it makes for a great stop, letting you return at night to observe the nocturnal creatures. Plus each day the team of experts run special encounters which allow you to get closer than ever to some of the park residents including trout, reptiles and native birds. If you’re in New Zealand, searching for a family-friendly thrill activity, definitely go to Rainbows End with over 20 rides and attractions there’s something for everyone, every day of the year expect Christmas day. The staff are incredibly helpful and kind, and go to all lengths to satisfy your visit. We enjoyed a fantastic fun day at Rainbows End and the kids just loved it!! Grab a day pass and go on whatever you want! We loved the Roller Coaster and some of the rides will have you screaming, but in a good way! The Log Flume ride is always good fun without the fear factor. Piper really enjoyed Kids Kingdom it’s a great sheltered entertainment centre just for the younger kids, children 8 year and under to run around and they have a blast. Rainbow’s End is open from 10am to 5pm each day and is worth adding to your must do list while in Auckland. According to our 10 year old son, this was his best experience throughout the whole trip! New Zealand is the iconic Rotorua adventure activity in the world’s largest downhill park in the world, overlooking the spectacular views of Lake Rotorua & Mokoia Island. The Original OGO New Zealand has been operating for over 19 years and is the iconic Rotorua adventure activity offering the unique experience OGO Globe Riding, basically just rolling down a hill in a large inflatable ball. Because it’s great fun, you want to go again and again. We chose the Zigzag track… and it was awesome, such a thrill! sitting in some warm water (winter time), being rolled down left and right down the track, it was so much fun. Courtesy Clothing is available if your forget (Top, Shorts and Towel), Free Wifi, Hotpool and courtesy transport to and from Rotorua on request! Open 7 days, 364 days a year, rain, hail or shine. Anyone from 6 years old can roll and we highly recommend it! Go on, we dare you. We had such an amazing time in Auckland, its the perfect haven for kids. If you’re heading to NZ be sure to get in touch with any questions you have as we would love to chat. Welcome to another blog, I love to introduce our followers to new brands we love, especially when people aren’t familiar with a brand and haven’t touched or felt the quality with their own hands. I prefer Piper to have quality over quantity that’s why we love Happy Go Ducky Toys quality keepsake toys and gifts made in the Czech Republic, it’s now one of only a few countries that are still producing handmade traditional wooden, tin and crochet toys using only the best sustainably sourced materials, traditional tools, machinery and designs, which date back as far as 120 years ago. Beautiful, quality pieces with simple, durable designs that are loved and will be for generations. So Happy Birthday Happy Go Ducky and welcome to the blog. Happy Go Ducky turns 1! Everyone says it, but oh how it’s true! How quickly time passes! 1 YEAR OLD…Yes, in February Happy Go Ducky will turn 1…seems like a good time to look back, reflect and hope that we have a learnt a thing or two! As I said, time flies but I can’t say it’s all been fun. If you want a challenge, try opening a new business importing something (anything!) while you have a baby on the way. In many ways, it is like having two babies…only with less nappies I guess! So what have we learnt? There is no clock off time. You really do only get out what you put in. It’s nearly impossible to work with a toddler! When you think you have it figured out and kind of know what your doing, something else will pop up and throw you off the horse when you least expect it. Thankfully a year on, we’re still getting back on that horse and are even more determined than ever to make that beast our friend! What keeps us going? For me, it’s our son (um, just everything about him!) and as cheesy as it sounds, seeing our toys go to good homes. Simple, possibly boring, but very true. With all the work that goes on behind the scenes, in finding our suppliers, building a relationship with them (from 15,000km away), getting all our toys here safely (which takes months of hard work in itself), to then find out that people love them just as much we do, well that just makes me do a little happy dance! 12 months ago we took a HUGE chance and although it’s been difficult, we’ve built something special with toys and brands that we trust, love and are incredibly passionate about. I think people can see and feel that when they visit our store and I’ve found more and more that people are searching for quality over quantity. They want something special that they can keep that’s well made, beautiful to look at and most importantly, safe for their children to play with. So we finish 2016 and our first year feeling grateful. Grateful that we survived. For all the support that’s surrounded us and kept us going, and full of excitement and motivation for what 2017 will bring and all the amazing and exciting new things we have to share with you. Thank you to everyone who has shopped with us, told a friend or loved one about us, followed us on Facebook and Instagram, shared their pictures with us or taken the time to send us an email to say that they love our toys and will shop with us again. You have made our first year even more wonderful than we ever could have hoped for! Tasty and Easy to make, plus they make for a stylish way to impress your guests. Storing the salad in glass (mason) jar keeps it fresh for 5-7 days. A big tick from me is prepping your meal ahead of time. You can use any ingredients you like, just follow the special technique to the salad assembly to keep all the contents fresh – The vegetables and protein need to be layered in a particular way so it doesn’t go soggy. Layer 1 – Dressing – 1-2 tablespoons. Making these salads is really easy. Just complete any cooking or chopping tasks and let every thing cool before assembly. These are the Steps and ingredients that went into the ones pictured but be creative and mix it up with what you like. Seal tightly, refrigerate and use within 7 days. Be sure to let us know what you think? Get to Know Katrina 2masters and a miss and follows the adventures, fashion, experiences and reviews that Katrina and her children come across. 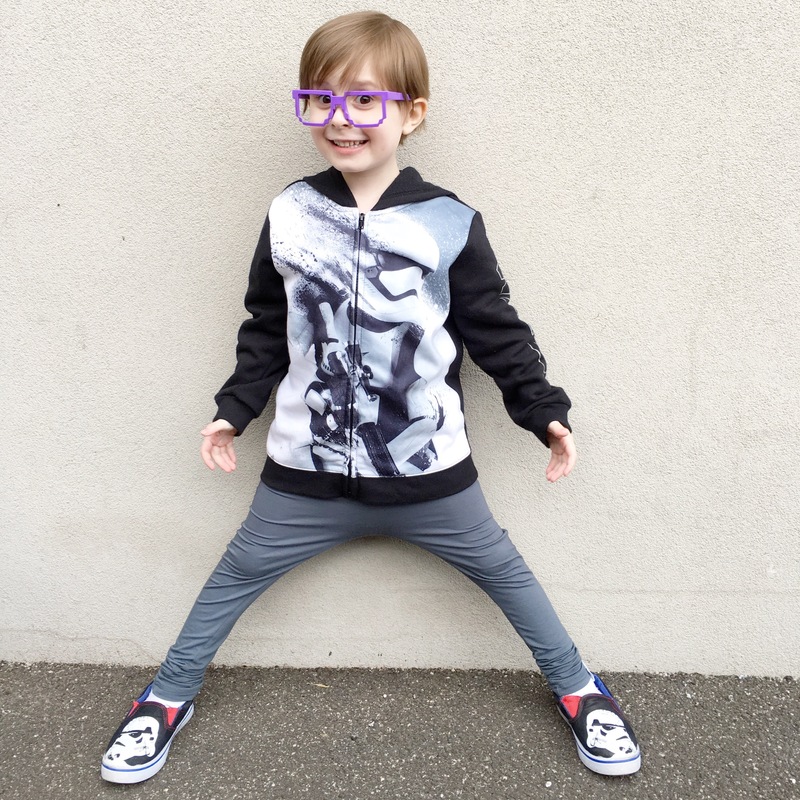 We Have Progress – Dex is five years old and has newly been diagnosed with ASD, which has explained so much of what he has been experiencing and struggling with for a long time. He struggles daily with sensory issues, so loud noises, textures and things that would normally make others uncomfortable, are very painful or distressing for him. I hope that this blog entry will relate to other mothers with children on the spectrum or those who struggle daily with tasks that most children see as second nature. One of the things that distresses him the most is haircuts. Anyone only has to say the word “haircut” towards him, and he becomes anxious and a lot of the time will scream and hide. So for a while we haven’t even mentioned the word, never mind suggest he have one. I mean, it’s only hair right? Not a big deal if his hair is long. Well, last night we were talking with Kingston about haircuts, and that he could have a surprise egg after his next one. Well, Dex overheard and told me that he wants a surprise egg and a haircut too. I took it with a grain of salt. If he wanted one, great! If not, fine with me too. So we spoke about it, with no anxiety and no concern except that he only wanted scissors to be used and no water spray. We looked on good Ol’ Pinterest and found a few cuts he liked. Something I’ve learned along the way of raising a child with anxiety is when you include them in the process, they feel much more comfortable and are able to feel more in control of the situation. This is definitely helps Dex every day. So off we went to bed with excitement and wonder. The next day, we went to our local shopping centre and again, inviting him into the decision making, let him choose which salon we would go to. At first he was nervous, so we sat down in their waiting area and I told him we would just sit and look around, because he takes time to warm up to new surroundings. After about 10 minutes, the hairdresser came and spoke to us and asked Dex if he was ready for his haircut. He told her “maybe just one more minute and I’ll be ready!” I loved that he was able to verbalise his feelings and again feel as though he had control over the whole process. If he in the end decided he was too scare for one, we would’ve left and waited for another time. But after thirty seconds had passed, he decided he was ready to get into the chair! This was a HUGE deal in itself because I don’t even remember the last time he sat in a hairdresser’s chair. By now my nerves and excitement had kicked in. As they put the cape on him my heart started pounding for him. Would he start to get anxious? Would he meltdown because his little body and mind doesn’t handle these types of things well? Dex looked over at the little trolley with all their equipment and I could see in his face he was unsure. He told the hairdresser, Jess, “only scissors, OK?” And she promised him, only scissors. I could see his shoulders drop as though he could relax now. Dex was a champion. He sat there with a smile on his face literally the whole time. He even told Jess “I need you to cut more around my ears, I want to see my ears, oh and my eyes cut more there too.” I watched in amazement and had a giggle to myself as he stated to her, quite calmly and almost like an adult, exactly what he wanted. He used his manners, he kept telling her how good it looked and when she had finished he was SO excited. He high fived Jess the hairdresser who told him how proud she was of him. I think almost everyone he told about his haircut told him how proud they were of him! And so they should be. 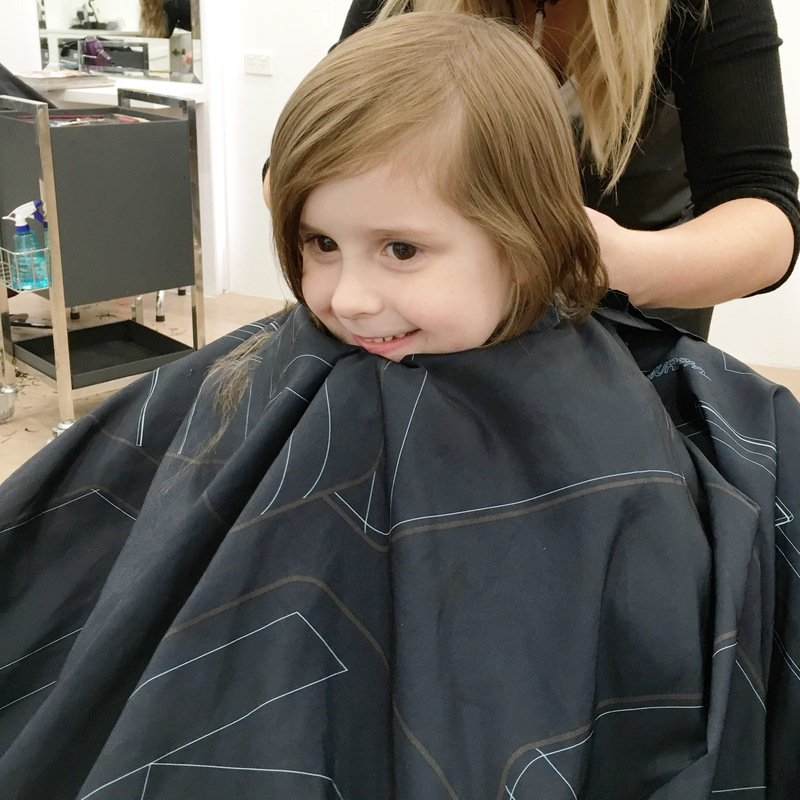 This little boy, who has had a massive fear of even the word “haircut” or being asked if he wanted a haircut overcame huge anxiety and sensory complications and took control of the situation. For any five year old I think that’s pretty freaking amazing. But for Dex, for who he is, this is a HUGE deal. For him and for those who love him. I couldn’t have been prouder for the way he dealt with today. We’ve overcame a hurdle today and we have many more to come. But one step at a time, and this was a big one. Please leave comments we would love to hear from you…. With our own business, three children aged 18, 9 and 2 our life is crazy, actually the word ‘crazy’ doesn’t even seem to cover it! So anything thing I find that makes life even a little easier is a god sent! I was so excited to receive my Daily Orders board last week, its perfect! With a quick glance I can get an overview of who needs to be where and doing what each day. Now once a week I only need to consulate everyone’s calendars and add all the events to the board, and if anything changes the person it involves is responsible to make any changes and by keeping it in a area of the house that everyone sees each day we have no excuses to not remember what we need to be responsible for each day, plus it looks great too which is always a plus..
Today we would like to introduce to Kelly Mum and operations Manager of Daily Orders who have been busy transforming lives all over Australia we are lucky to have her share her top tips on home to organise your home in less than 5 Min a day. Is your poor time management affecting your household? Your happiness? Your stress levels? I get it. I really do. just to name a few things. That’s just you and the kids. Don’t even start on the household management. What if I told you that you could get your house organised in just five minutes a day? You wouldn’t believe me would you? Think of all those minutes you stand there staring into space thinking about what you need to do, all those minutes you mindlessly check your device to see what someone else is up to. Do something for me one day. Add up all the time you spend on your devices. You won’t believe how much it is. In a few months I’ll be releasing an e-book on how to organise your life in just five minutes a day, but I wanted to give you all a sneak peek into what you’ll get. On the surface, it’s pretty simple stuff, but when you don’t have time to organise what’s already on your super busy plate, the last thing you want to think about is how to get organised, right? I’m not talking about having your shoes spit polished and your benches white glove ready, but about getting things in order, reducing clutter and being able to actually live your life without all that ‘stuff’ getting in the way. You know the stuff…the snow globes from that overseas trip you took in your twenties **puts hand up**, the kids toys – oh the toys! All that stuff that you put in that letter holder on the kitchen bench that you’re going to sort through on the weekend. Yep, I hear you. I’ve been there. So, enough about why we’re here. Let’s start sorting things out. So I mentioned that you need to plan, prioritise and set goals. The best way to get started with your plan is by creating a list of all the things that you need to accomplish in a week, and then narrowing your perspective to all the things you need to accomplish in a day. Having this information in a snapshot view makes it possible to make alterations where necessary. Having served nearly fifteen years in the Navy, I’ve definitely been exposed to some serious planning. As you would expect, in the Navy we have a very rigid planning process in order to achieve everything that needs to happen on a ship. Consider the conduct of daily events at sea; with three or sometimes four meals a day for around 200 sailors and Officers, refuelling the ship, conducting weapons firings and helicopter operations, ammunition and stores loading, maintenance, engineering trials and the list goes on. To ensure a smooth flow of operations, the immediate planning cycle is broken down into four documents, namely Daily Orders, the Shortcast, Midcast and Longcast. Daily Orders as the name suggests, promulgates what is happening that day, the Shortcast is the detailed plan for the coming two weeks, the Midcast is the plan for two weeks to three months, and the Longcast is three months plus. Without this detailed level of planning, there would be a serious amount of incompatible operations, leaving us unable to achieve the mission. The same goes for a family home. There are always countless things to do, whether it is the grocery shopping, doctor’s appointments, sporting commitments, travel, dinner dates (I wish, right?) and more. With high dependency on mobile technology, you may be tempted to simply download an application that will help you create a plan. While it cannot be disputed that mobile applications have a host of advantages, they do have one glaring disadvantage. They are entirely too private, particularly when you consider that a plan may need to be shared with family members or colleagues within the workplace. Yes, I know you can synchronise your devices, but how impersonal is it? “Hey honey, did you check my calendar? I put it in there.” No thanks. In these situations, it is better to have a clear reference point, where you’re able to see all the plans, and establish how they fit into the grand scope of things. My business, Daily Orders, gives you the ability to share your plans with the rest of the family in one central place. How do we do that? Our gloss surfaceblack acrylic weekly planning boards are mounted on your wall, and there youcan put everything you need to achieve in bright liquid chalk markers. Whatare the benefits? Here are just a few. Reduce wastage – no need to spend $30 on a calendar each year that you forget about in February. Reduce clutter – no scrap pieces of paper lying around the kitchen and home to write your notes on. All of your notes and plans are on the wall, out of the way. Reduce screen time – we spend enough of our day on our devices, it’s about time we put our handwriting skills to work and used them to communicate with our families in a meaningful and valuable way. Increase productivity – set clearly visible goals that the whole family can get involved in. Using Daily Orders to plan your week will help you feel calm and in control, and most importantly it will give you back the one thing you desperately want – time. Time gained by being organised. With Daily Orders it is possible to create a simple and clear list of all things that are to be done and by whom. Setting goals will also help you easily accomplish your tasks in a given time frame when done correctly. Remember the old saying, “How do you eat an elephant? One bite at a time.” Goals need to be realistic, manageable and achievable in a timely fashion. If they are large goals, like making the house sparkling from top to tail, break the goals into smaller chunks. Not planning means that you are reactive and responding to the events of the day as they occur rather than being proactive and clearly defining what needs to be achieved. Prioritising – Once you have set your goals and defined your list of tasks that need to be achieved, you need to prioritise. It is no good saying that you need to wash the cars this afternoon when in fact, you really need to do the grocery shopping. No food equals cranky family, and that is no good for anybody! Prioritising is part of effective planning and it involves de-conflicting your goals to accomplish tasks in order of importance. When you learn to focus on the priorities, it becomes far easier to achieve your goals. Without prioritising, it means that small but very important tasks may be overshadowed by large, time consuming tasks. Put it this way, what do you absolutely positively have to achieve today? The mistake many people make when they put all the things they want to do in a day on a list is to check off what they can do quickly, leaving the hard and time consuming tasks to deal with later on. What happens when something comes up and you are not able to continue doing what you had planned to achieve? Sometimes, life just gets in the way and at the end of the day, you realise that you have not done anything worthwhile. Not only have you not achieved what you needed to, but along with that can come the associatedemotions; perhaps guilt or frustration. These feelings aren’t good for anybody, so let’s try to combat that with planning, goal setting and prioritisation. Once you’ve done all of that, it’s time to start checking things off your list. If this sounds like valuable information to you, and you want to be first on the list to discover when our e-book is released, jump on over to https://beadwindow.leadpages.co/howtogetorganisedin5minutesaday/ The best part is, you’ll get the e-book at a super discounted rate of just $1.95 for signing up. Getting organised for way less than the cost of a cup of coffee? After you’ve signed up, jump over to http://www.dailyorders.com.auto buy your weekly planning board today. Piper Sienna readers will also get free shipping when you enter code PIPERSIENNA at checkout. See you there soon I can’t wait to help you get more time in your life. Thanks Kelly, make sure you check these out we just live our board and I’m getting so much more achieved by using it. With much anticipation and excitement Piper and I are awaiting June as we are headed to the OUT OF THE BOX festival for children 8 years and under at the Queensland Performing Arts Centre (QPAC) in Brisbane. This longstanding biennial event is a highlight on Brisbane’s cultural calendar for both schools and families alike. This was the first time we will be attending the festival, which has been held since 1992. We are ready and waiting to see and be involved in the CREATIVE CREATURES, KIDS’ THINK TANK, RAIN, SNOW AND A GAZILLION BUBBLES! We will also be participating in the Wellness Workshops which are designed to connect the mind and body through the principles of movement, stillness and mindfulness, and educate about the origins of these art forms seen so strongly in many Asian cultures and spirituality. The workshops include children’s yoga, mum-and-baby yoga, tai chi, Kung-Fu, and meditation. These art forms have been around for centuries, and have proven long-term health benefits and we cant wait to get involved! This event is Perfect for the little ones helping them explor and learn through numerous creatively designed activities and plays to enhance learning and discovery. Taking place 21 – 28 June 2016 at QPAC and across the Cultural Precinct and South Bank, Brisbane, Out of the Box provides a rich arts-based program for both schools and the general public. This year’s Festival crosses over the end of theschool term and into the June school holidays. Out of the Box has been curated by QPAC for 24 years and is the only arts festival in Australia dedicated to children 8 and under and one of only a few in the world. It’s also the nation’s largest early childhood arts festival and had more than 103,000 participants in the 2014 festival. Struggles with infertility – Should I have waited so long to start trying? I’m writing this post because my husband and I struggled with infertility. Luckily, it was a simple fix but I can’t help but get mad at myself for waiting so long to start trying to conceive only to find out that we would have struggles in getting pregnant. I was 19 when I married my husaband(23). At the time, I was SOOOO not ready to have a child. We had agreed to wait at least 2 years before trying to conceive. Those two years flew by and we enjoyed every minute of them. When the topic of children came up once again, we both agreed that us being us right now was the best. We were settling down and trying to find our career paths. We didn’t want to bring a child into our fast paced unknown crazy lifestyle so again we agreed to put it off another year or two. Fast forward two more years. We celebrated our 4th anniversary and were living comfortably. We had most of all our debt paid off, we both just received two really good jobs for our area and we were finally slowing down. Of course, like any other married couple you were 24 and 28, we got asked the question, “so when are you guys going to have kids.” I am not joking you like 15 times a day….A DAY! It drove me nuts. It wasn’t that we didn’t want kids, it was just we were loving our lifestyle and content with us for the time being. Another year went by and one of our family friends announced she was pregnant. I couldn’t have been more excited for her. But at the same time, I felt sad, that I was missing something and that something might be a baby. My husband, needless to say, agreed! I hadn’t had a problem with my menstrual cycle until I got on birth control. That stuff messes you up. I got on birth control right before I got married and it did WONDERS to my body……NOT. Within 4 months, I had gained 40 lbs. I went from a size 36 B bra size to a 36 DD and i was CRAY CRAY. Let’s just say I got off of it ASAP and we had just been “careful.” Since I got off the birth control, my cycles never got back to normal. After hearing our friends announcement, I decided to go get everything checked out. The 1st doctor i went to diagnosed me with PCOS, started me on some medication (that I didn’t need) and gave me what they call an HSG (where they shoot dye into your fallopian tubes to make sure they aren’t clogged). I didn’t feel like I was getting any answers so after a few months I went to another doctor. The 2nd Doctor took blood work, viewed my HSG and told me I had a little low testosterone level and my uterus looked to have a slight indent but something that was pretty hard to detect unless you look really close. Needless to say, he admitted he was no help and referred me to an OBGYN Specialist. This is when I met the blessing of a doctor that would help us become parents. I guess what I am trying to say is, I am a firm believer for “if it happens, it was MEANT to be.” But I deep down wish that I would have gone through all of this 4 years ago. We will be celebrating our 8th Anniversary this next Monday. We are the ages of 27 and 31 and have our first child. I can’t help but think how many kids we would have if we would have tried all this earlier. If you are like me, I was in denial that something was wrong so that was one of the main reasons i kept putting it off. I didn’t want a doctor to tell me that something was wrong. But waiting, we became more mature and this parenting thing kind of seems a lot easier now that I am older. I love my child more than anything and wouldn’t change a thing about our journey but if your reading this, your trying to conceive, go to your doctor. THEY WILL HELP. Please Leave Comments as we would love to hear from you….